There in the back of your fridge is an undated, unidentified leftover. Whether you decide to eat it or not may depend upon how desperately hungry you are, but even then you will probably check the smell and appearance. If it smells yucky and looks icky, you will probably not eat it. If you go so far, its taste may be unappealing too. And without question some of the subtances involved can be very toxic. Our instinct is to avoid ickylooking, yucky smelling slimy food growing fuzzy. This all has a nice evolutionary explanation. Many microorganisms, bacteria and fungi, make a living by decomposition of organic material. When this organic material is your food, they compete with us for it. So your decision to pass on something that clearly was food (unless it was something a biologist stored in the fridge for another reason, but more on this another time) means the microorganisms have won the competition. What if the microorganisms, which surely are present, did not make the leftovers icky or yucky looking? Well, then we would surely eat the food, microorganisms and all, and their ability to produce offspring would drop to zero. The ability of microorganisms to make food look icky and yucky in a hurry is directly related to their reproductive success. In other words, those microorganisms who are most successful at warning off their gargantuan competitors win the competitions most often and leave the most offspring. And there is a flip side too. Those humans who responded best to these signels from microorganisms avoided potentially unsafe, toxic foods, and so both parties in this interaction "win" so to speak. This is how instinctual likes and dislikes are shaped. All of our ancestors thought toxic ickiness was to be avoided, and those who did not ended up at the shallow end of the gene pool. Now of course not all microorganisms produce toxic metabolic byproducts, and we have learned to like some safe "spoiled" foods, like cheese and sauerkraut. Because our instincts have been shaped by toxic food spoilers, innocuous food spoilers can hide in plain sight, so long as they make our food look icky too. Hopefully this has given you new insights on appreciating the mystery items from the deep recesses of your fridge. The Phytophactor has to thank those lovely people at the Online College Blog for posting the Top 100 Botanical Blogs. Yes, these are the sites that put the log in blog. There so many sites here for plant lovers to wallow in that their productivity, social life, and family values will be reduced to nil. What? Of course plant people have social lives! What do you think the birds and bees are all about if not pollination? Of course the primary reason the Phactor is calling this to your attention is because the Phytophactor is number 20, one of the experts, which is as it should be! Actually modesty prevents me from suggesting a category for myself, the experts' expert, but perhaps this will get corrected the next time around. I'm sure they just didn't know. Ash Wednesday! What a great idea! Fraxinus is the Latin name for ash. 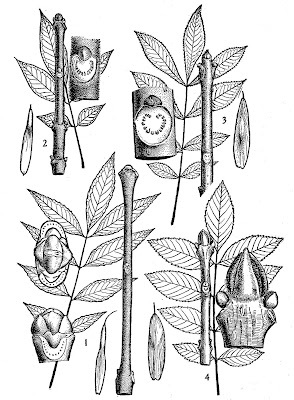 This figure illustrates white ash (1), red ash (2), black ash (3) and european ash (4), Fraxinus americana, F. pennsylvanica, F. nigra, and F. excelsior, respectively. Unfortunately here in Lincolnland these great shade, forest, and timber trees are being treatened by an introduced insect, the emerald ash borer. This Asian insect is spreading and millions of ash trees will die as a result. The American elm and chestnut have already been largely wiped out by imported fungal diseases, so this would not be the first time an important and major tree has been been eliminated by an exotic pest. Unfortunately there isn't much we can do to save the ash, even by having ash wednesdays. By the time a pest like the emerald ash borer is discovered the type of drastic action it would take to eliminate the infected trees and create a large enough ash-less zone to stop the insect is literally beyond our capabilities. Millions of trees would have to be cut and destroyed, and many would be on private property, so image the opposition, protests, and legal actions. Imagine the expense. Imagine Lincolnland without ash trees. What will happen when we lose all the ash trees? It probably won't have much of an impact on the success of our professional baseball teams here in Lincolnland; I think they've already switched to rubber bats. And of course all the unprofessional teams use aluminium bats. And it's hard to know what other species will become losers too because ash trees are now missing. But some sort of domino effect will certainly take place whether we notice it or not. So enjoy ash Wednesday while you can. Time to go and hug an ash tree. I can't wait for fig Friday! It is a wonderful day, particularly for mid-February, when those first seed catalogues arrive. They provide hope and give you something to look forward to. April is only 2 months away; it seems like you can hold your breath that long, and you begin thinking about the seeds, the flowers, the trees, you want to plant. The analytical part of my brain knows that those catalogue pictures are promissory notes, and like bad investment schemes, some of them will simply not pay off. And yet, a gardener knows that some good things do come from these small packages. So while grounded by pragmatism, it takes a certain degree of optimism, a certain confidence in the future, a certain ability to envision things that may grow and develop from small beginnings, to plant a seed or stick and be able to envision a bounty of fruit or a tree in flower. I wish we had more politicians that were gardeners. I'd have a lot more confidence in them if they actually took time to look through a few seed catalogues. But there is something about the type of person that wants to go to law school, play golf in their spare time, and run things that sort of precludes gardening. Golf may actually stunt their plant aesthetics to the point they think a monoculture of grass is attractive. Let's look at their lawns before voting. For one thing, most politicians want an almost immediate reward or payoff for their investment, be it monetary or some other effort. Gardeners know that it takes planning, and work, and investment, and patient nurturing to get rewards from plants. Gardeners also don't ignore the little things, like a some sprouting weeds, or some little spots on the leaves, or a few spider mites, because these little problems can become big disasters if not attended to. But very few politicians have time to deal with the little problems when they are still little. This is partly because they are not looking very far ahead. Their temporal near-sightedness means they can seldom look beyond the next election, so their solutions are often flawed, doomed in the long-run. And of course our politicians live in big cities because this is where the power resides. They don't live in smaller places where there is enough land to garden. In cities people are out of touch with the processes of natural life, and rain is an annoyance, not something to be measured in a gauge. I wonder how many of our representatives in DC have ever picked their own tomatoes? Yes, a lot of people with misplaced priorities are running our country, and you wonder how it ever came to be this way. At the dawn of civilization, was it the hunters, whose lime-light was fading as the game became scarce and gardening became all important, who became the politicians, the community leaders, when it should have been the gardeners all along. But the gardeners really don't like running things and they were busy planting, and weeding, and harvesting, and storing, and planning for next year's crops, and you had to find something for the laid-off hunters to do, and it seemed like a good idea at the time. But now, a few thousand years later, we might be better off if we pressed a few more gardeners into positions of power. But enough of that. That new violet is hardy in zone 5 and is supposed to do well in the poor soil and shady conditions under trees! Wow! How many of those should I order? Enough to stimulate the economy, of course. Senator Burris misforgotspokelied. Is anyone surprised? Well, folks, I don't think anyone here in Lincolnland is even mildly surprised. Now that Senator I-have-memory-slips Burris has had a month or so to think about it, he now recalls talking to our impeachy former Governor's brother about the senate seat and helping with some campaign contributions. So in his former testimony he sort of misforgotspokelied. Ah, but you know those Blago boys are such kidders, who knew they were serious! Of course in his appointment hearings Burris was asked point blank if he ever discussed the senate seat with anyone related to the Governor. No, Burris did not remember a thing. So we are to believe the telephone rings and the brother of the governor asks about possibly appointing him to the senate, and this career political hack who has built a garveyard monument to his own mediocrity, doesn't remember a thing about it. Sure. I twould be easier to believe they don't grow corn in Lincolnland. Why fess up now? You can almost see the sweat on Burris' forehead. Do you think it was those ginkgo pills that improved his memory, or maybe our impeachy governor's recent threat to blow the whistle on all the political deals and other dirt he knows about? Why you'd think Senator Burris may have dealt with our former governor before, and thinks he isn't bluffing. So Burris decides it's better to do some spin control now rather than get Blagoed later. Wonder what other old memories will surface in the coming weeks as various state office holders decide to Burris it? No question it will continue to amuse us voters of Lincolnland. My heart goes out to people suffering in these hard times. I'm so fortunate to be largely isolated from the economic down turn. Living well within your means buffers you from hard times. Hardly a day goes by without some sad report of people in financial trouble. And as the hard times spread it touches everyone. But I can barely stand to read about some of these stories. I just don't know how they manage! Scraping by on $500,000 a year is just so difficult even under normal conditions, but when the economy turns south, well, things get really tough. And here you thought you had it bad. Well, this just shows you how difficult things are for people all over. Can you imagine the hardship of having to wear the same designer gown to two different functions! Can you imagine having to send your kids to a public school? Or, having to fire the nanny or housekeeper and discovering that dishes and kids do not clean themselves? And, just think about (oh, the horror of it all is almost too much for decent people to bear) having to use public transportation! Their sense of entitlement boggles the imagination. Or maybe us mere peasants just don't understand our society's aristocracy. Most certainly our economic aristocrats don't understand the pain and suffering of real people. Anyone for a piece of cake? Hat tip to the F1 for sending me the link to this article. Ground hog day is a very funny movie, but in general mammal weather prognosticators do little more to inspire confidence than wooly worms or farmers' almanacs. Which is to say they don't know squat. First of all what self-respecting mammal comes out of hibernation in early February? That would only happen in places where it doesn't matter whether winter lasts another month and a half or not. Ground hogs certainly don't make February appearances in Minnesota or Maine, and who cares about winter at all in southern Georgia? As I listened to the radio report from Pennsylvania, it occurred to me that the continuation of winter had nothing whatever to do with shadow-seeing rodents. What makes anyone think a ground hog is afraid of his own shadow? Now maybe the shadow of a golden eagle sweeping by would frighten a golden marmot back into their burrow, but they live so far up in the mountains that early summer has already come to the flat lands. Pity that our local birds of prey are not mighty enough to cast fear into the hearts of ground hogs. It would be quite pleasing if the natural order of things included a predator capable of removing, one by one, the serial occupants of the burrow under my garden shed. Clearly the answer is not associated with such garden destroying chow hounds. There on the counter in front of me was the real reason for the continuation of winter. That roll of paper towels is decorated with snow flakes and snowmen, and winter isn't going to end until that great big roll is used up and replaced with towels decorated with little flowers. I am certain that is true. Hear me now and believe me later, the last paper towel will be torn off that roll and just like that the witch hazels will flower. Of course, they don't always wait for the end of winter either. That's PROFESSOR to you, fella! This really rubs my rhubarb! This issue is nothing new, and it ranges from our local news rag to the ever dwindling giants of news publishing. The issue has surfaced because, unlike all previous vice presidential spouses, Mrs. Biden has a doctorate in education and teaches college courses. So here is my annoyance. Newspapers, including The Times, generally do not use the honorific "Dr." unless the person in question has a medical degree. I used to ask all of our PhD students what PhD stands for in the rather perverse perspective that you don’t deserve any degree if you don’t know what its honorific stands for. If you are a reasonably well educated person, you are undoubtedly aware that PhD stands for philosophiæ doctor, written in italics because it is Latin. Philosophy means lover of knowledge, and here’s the critical part, doctor means TEACHER! MDs are physicians, a worthy and noble profession, but they are not teachers, and yet they are the only ones to merit the honorific doctor? Wow! Refusing to grant academics the honorific doctor because they don’t have a medical degree exposes the ignorance and attitudes of journalists whose 6.5 years of undergraduate study in communication or journalism at some state college clearly were not equal to their task. They probably still don’t know what the B in their own degree stands for even though the Phytophactor has tried to help. The real reason for not calling people with PhDs doctors is the fundamental anti-intellectualism that permeates our society. You certainly don’t want to acknowledge that some egghead intellectual actually might know and understand some things better than a journalist or other member of the general public. The American public much prefers good old boy street smarts and common sense that gets itself mislead and hosed on such a regular basis that what we really, really need in this country is a remedial course in critical thinking for everybody.